HomeRVUNL Notification 2018 | Apply for 3220 posts. 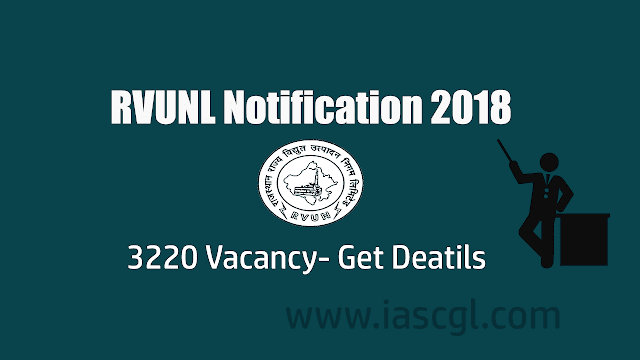 RVUNL Notification 2018 | Apply for 3220 posts. >Rajasthan Rajya Vidyut Utpadan Nigam Limited Released a recruitment notification for 3220 vacancies. Aspirants should complete Graduation Degree from an approved University established by law in India or its equivalent. Applicants should possess Higher Level Certificate Course or “O” conducted by DOEACC under the control of Department of Electronics, Government of India. He/She must have gained Data Preparation and Computer Software (DPCS) or Computer Operator & Programming Assistant (COPA) certificate organized under State or National Council of Vocational Training Scheme. Candidates should have gained Certificate Course on Computer concept by NIELIT, New Delhi. Note: Candidates must go through official notification for the physical qualifications.